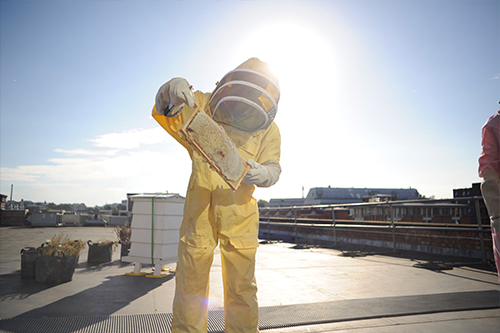 City, University of London has its very own beehives, located on the roof of the Innovation Centre. A dedicated team of staff and student volunteer beekeepers have been looking after the hives since March, supervised by Luke Dixon from Urban Beekeeping. Luke is a professional beekeeper, an expert in rooftop and urban beekeeping and a member of the Bee Farmers Association. Bees are a vital part of our eco-system and humans rely on them to pollinate plants and crops. With the number of bees in the UK declining, the sustainability team decided to set up the Bee Team to raise awareness of the importance of these important pollinators. The hive also helps to enhance the biodiversity and habitat on the City campus. Despite this being the bees first year in their hive, the busy bunch have produced a fair amount of honey. The first ever City honey harvest took place during September 2016. Take a look at a photo-diary that illustrates the honey harvest, step-by-step. It's wonderful to have so much honey in our first season. Now the bees can prepare for winter, huddling down in the bottom of the hive around the queen and being semi-dormant unless a sunny day allows them out. The honey will be available from outlets around City from October 2016.